Holiday in a beautiful ambiance with a view across the skiing area all the way to Mollseifen. You'll definitely like this holiday home. The living area has a large dining table with a separate fire-place corner. In the summer you can enjoy spending time outdoors in the adjacent garden with a big terrace set on a hillside. 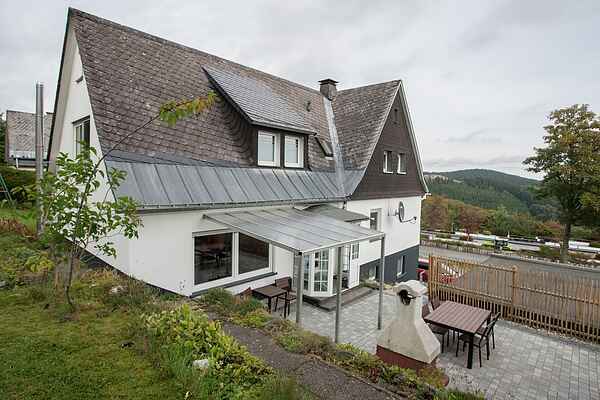 It is a single-family house in a quiet location directly above the "Postwiese" skiing area in Neuastenberg (2 minutes by foot). The garden is the perfect place for children to scamper about. On the beautiful terrace you can make the most of lovely summer days and evenings. You're also welcome to use the barbecue. Neuastenberg is approx. 4 km from Winterberg. In Winterberg you have the opportunity to shop in the many small boutiques and shops. It is also a great place for a night out. . Hiking paths and cross-country ski trails begin almost at your front door. Here you'll find restaurants as well as a small bakery. A butcher shop is located at the village exit. There is a charging point for an electric car.